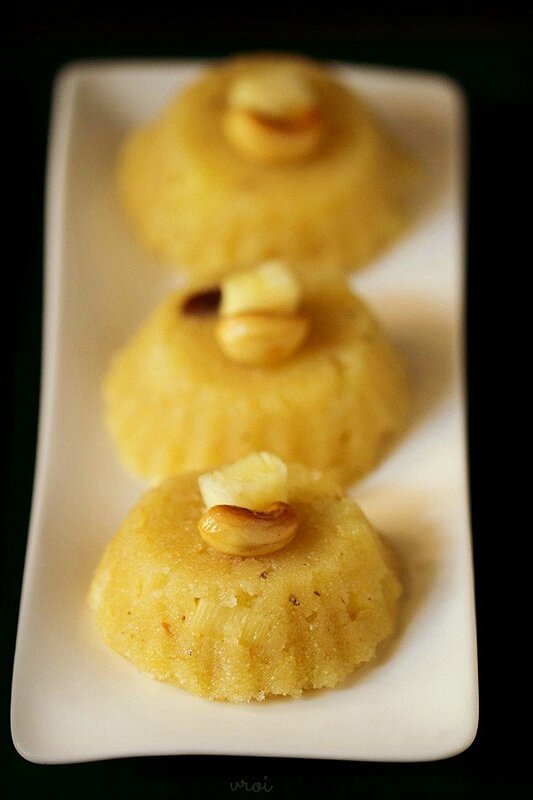 pineapple kesari or pineapple halwa is a delicious south indian sweet made with sooji (cream of wheat) and pineapple. 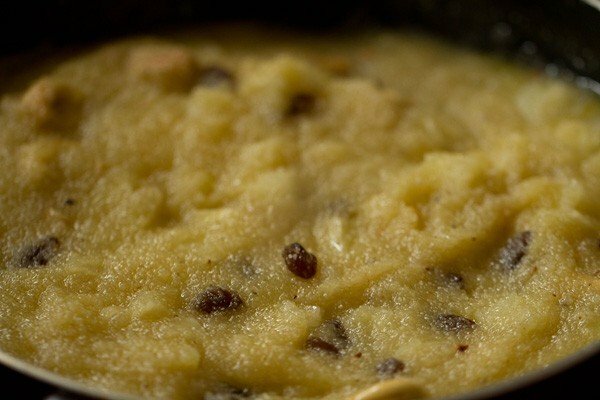 pineapple kesari recipe with step by step photos – pineapple kesari or pineapple halwa is a delicious south indian sweet made with sooji (cream of wheat) and pineapple. i had made pineapple kesari on basant panchami (spring festival). usually we prepare a yellow colored sweet dish. mostly its sweet saffron rice. but this time i made this yellow colored pineapple halwa. the color yellow signifies the color of spring. we also do a pooja of goddess saraswati on this day. goddess saraswati is the goddess of knowledge, learning, wisdom, art and creativity. kesari or halwa or sheera is one sweet which is quick as well as easy to prepare. it does not take much time too. 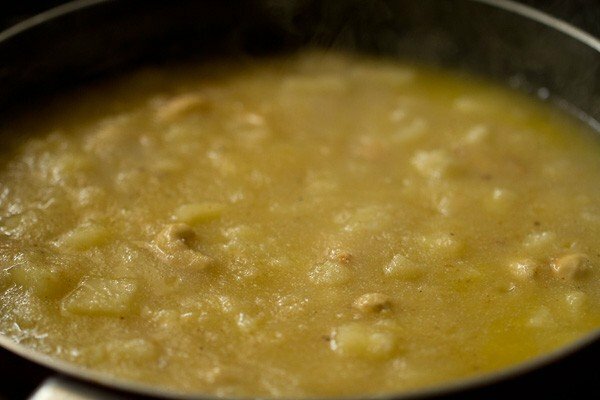 pineapple sheera is best served hot or warm. 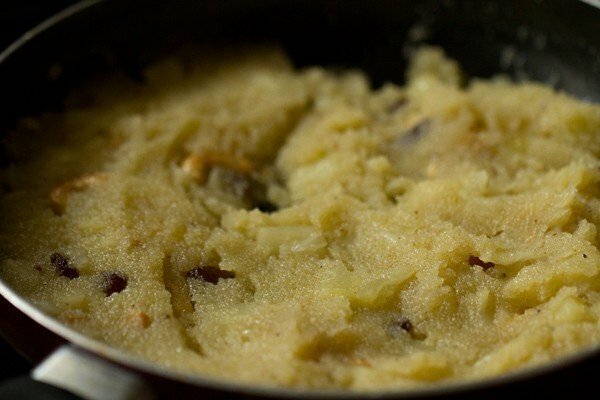 if you like a sweet breakfast, you can also make kesari for breakfast. 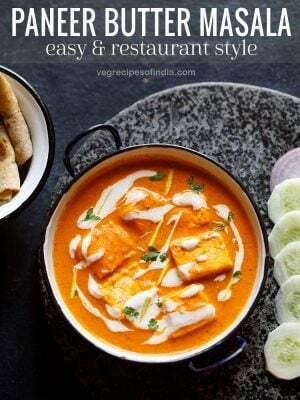 you can also serve it as a dessert after your meal. 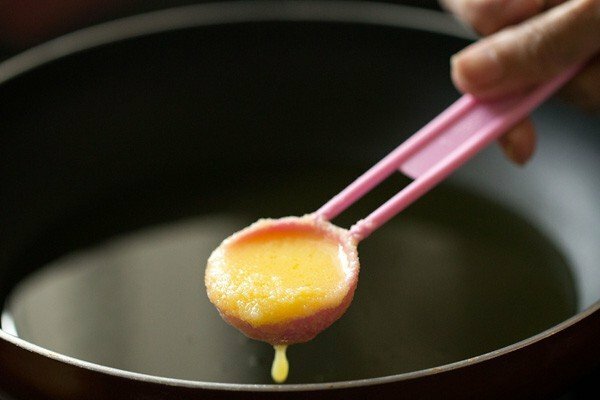 since ghee is added, i would suggest to serve it hot or warm. 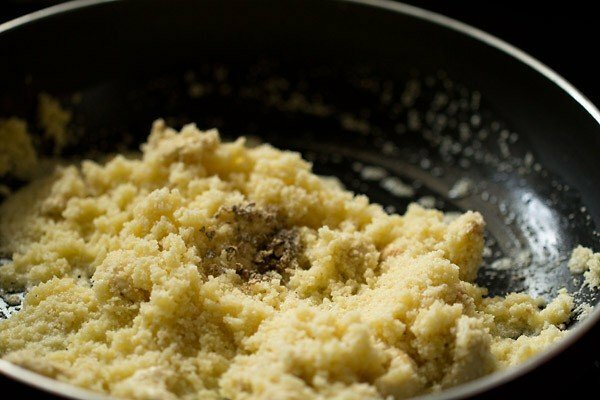 otherwise the ghee solidifies and you do get a grainy texture from the ghee in the kesari. in this case, just warm the kesari in microwave before serving. first chop the pineapple in small cubes and keep aside. keep aside. 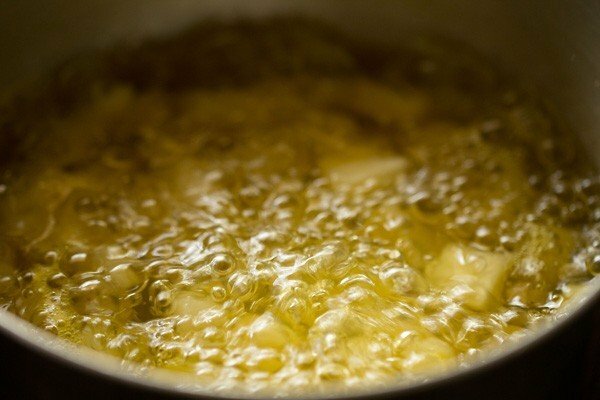 in a pan or sauce pan, take the 3/4 cup chopped pineapple, 1.5 cup water and 1/2 cup sugar. add one or two drops of the natural yellow color extract. 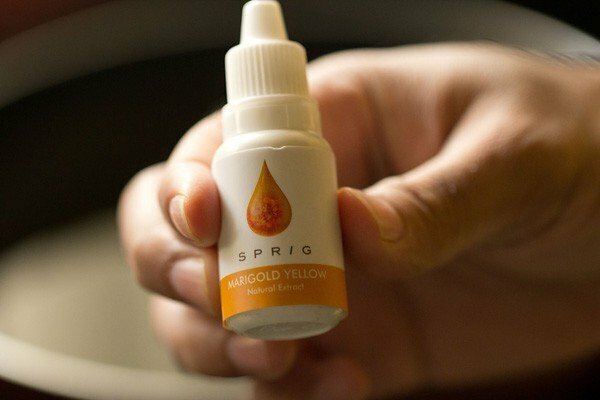 you can also add about 10 to 12 strands of saffron to get a yellow color. you can also add pineapple essence for a dominant pineapple flavor. stir well and keep this pan on the stove top and bring to a boil. 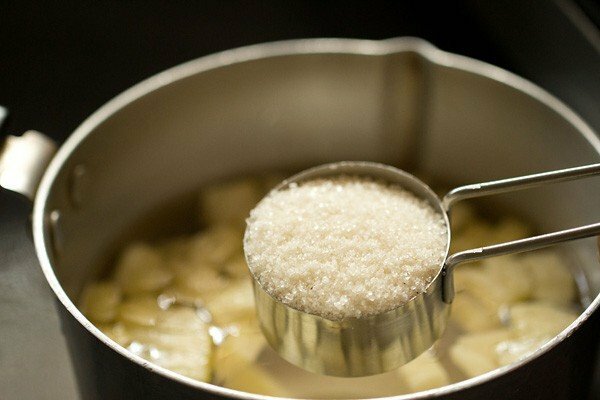 while simmering, do stir so that the sugar dissolves. 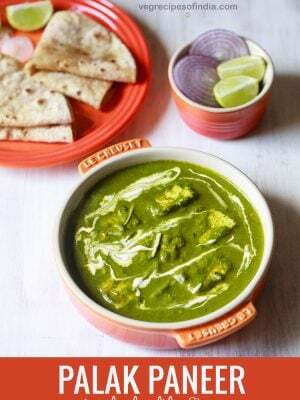 meanwhile, in another pan or kadai take 4 tbsp ghee and heat it. then add 12 to 15 cashews. stir and add rava/sooji. stir very well. then add 1/4 tsp cardamom powder and stir. stir & saute the rava till the cashews turn a light golden and you see ghee releasing from the sides. takes about 4 to 5 minutes on a low flame. 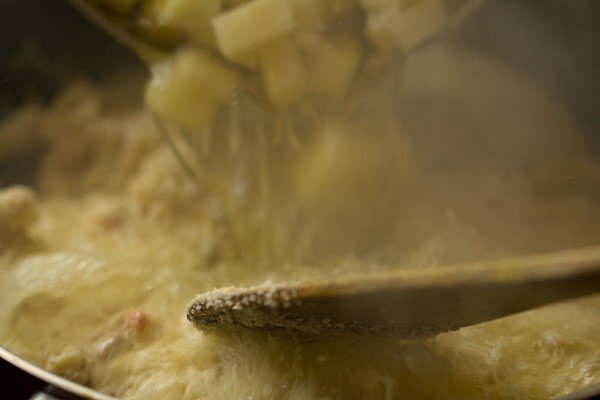 keep on stirring, so the rava does not get browned. by this time, the pineapple + water mixture would also begin to boil. pour the pineapple mixture to the pan with the roasted sooji. 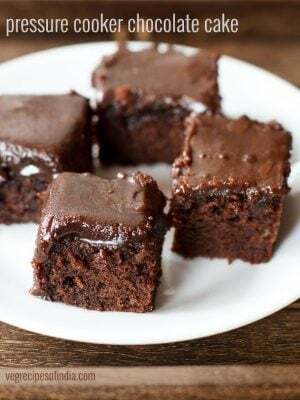 stir quickly and briskly so that lumps are not formed. simmer on a low flame and allow the sooji to absorb the water. in just about 4 minutes, the rava will soften up and the pineapple halwa is done. you should not see any creamish specks on the kesari. 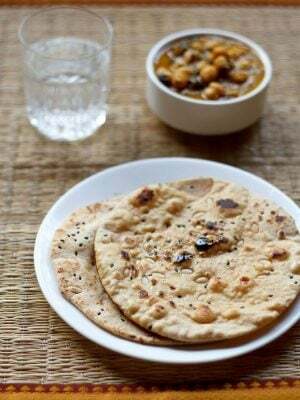 this means that the rava has not cooked properly. 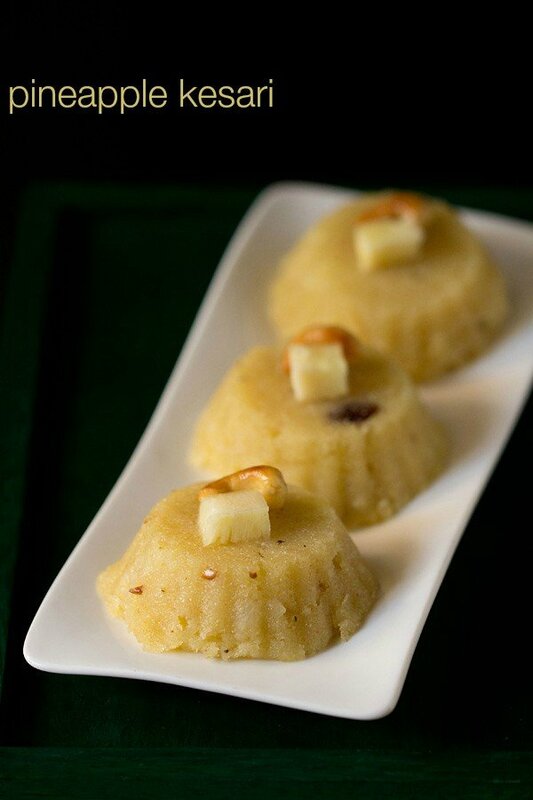 serve pineapple kesari hot as it is or garnished with some pineapple cubes. you can also use tinned pineapple slices. but while using tinned pineapple slices, no need to boil them in water. just add them directly. 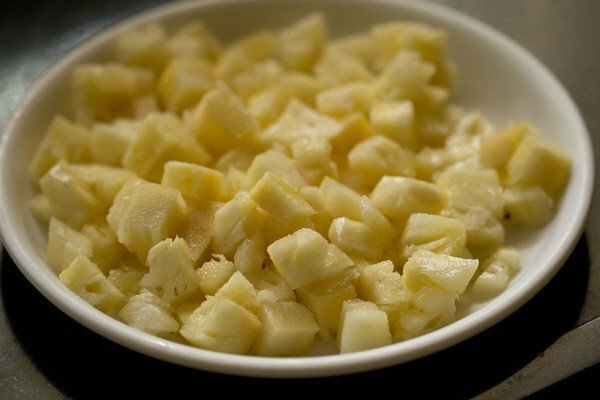 1. first chop the pineapple in small cubes and keep aside. from 4 pineapple slices, i got ¾ cup chopped pineapple cubes. keep aside. 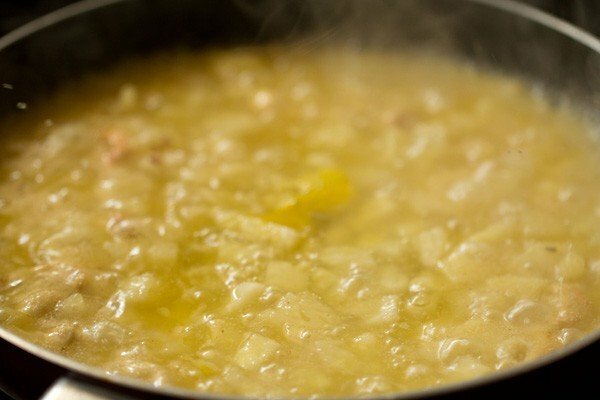 2. in a pan or sauce pan, take the ¾ cup chopped pineapple, 1.5 cups water and ½ cup sugar. 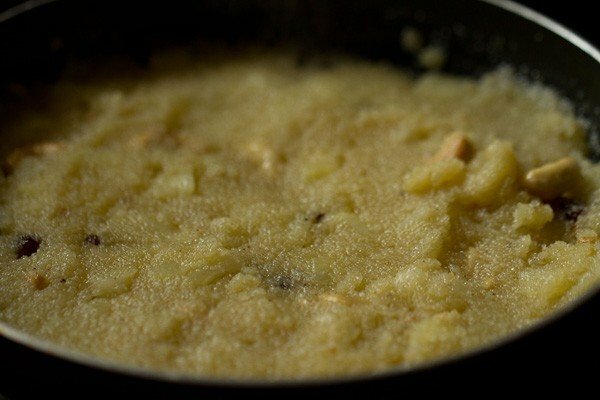 3. usually color is added to pineapple kesari. since i don’t use any synthetic colors in food, for the first time i have used natural color to give yellow color to the kesari. i used a natural yellow color extract. you can also add about 10 to 12 strands of saffron/kesar to get a yellow color. 4. add a drop of the color if using, or add crushed saffron strands. you can also add pineapple essence to give a dominant pineapple flavor. 5. stir and keep this pan on the stove top and bring to a boil. 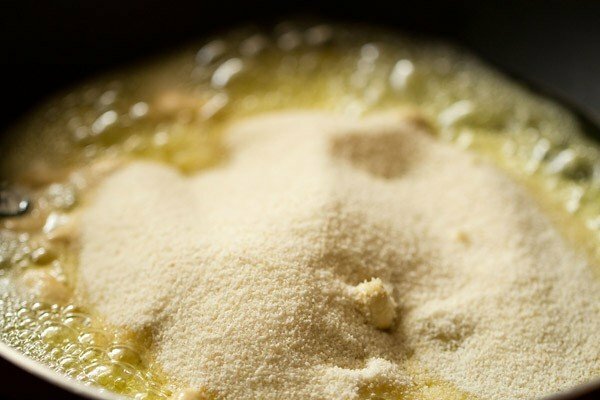 stir this mixture while heating up so that the sugar dissolves. 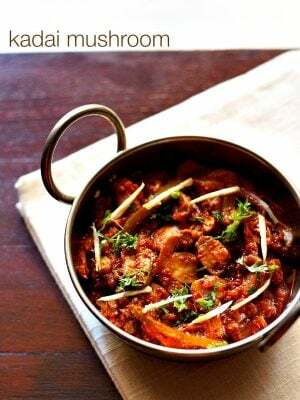 6. meanwhile, in pan or kadai take 4 tbsp ghee and heat it. 7. then add 12 to 15 cashews/kaju. 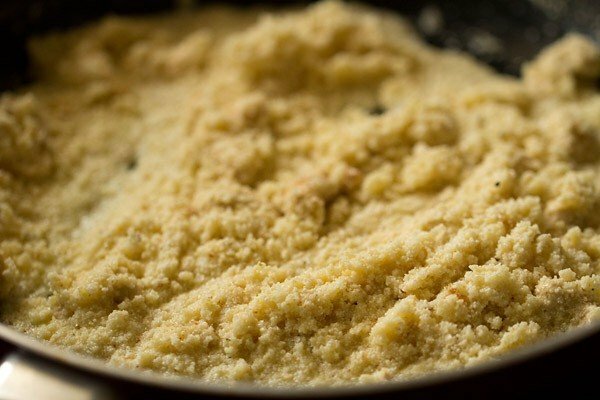 8. stir and add ½ cup rava/sooji/cream of wheat. here i used the fine variety of sooji. 10. then add ¼ tsp cardamom powder and stir. 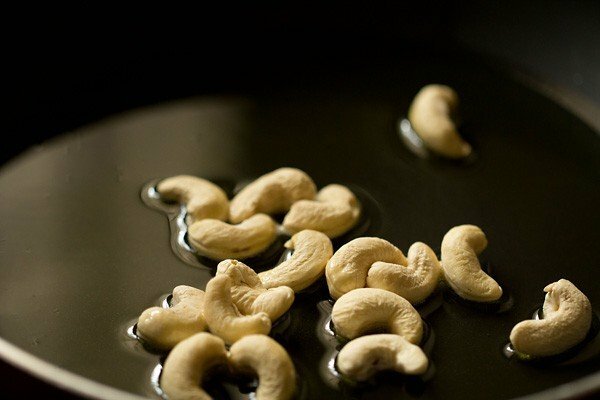 11. stir and saute the rava till the cashews turn a light golden and you see ghee releasing from the sides. takes about 4 to 5 minutes on a low flame. 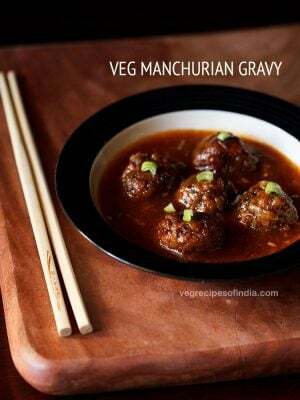 keep on stirring, so the rava does not get browned. 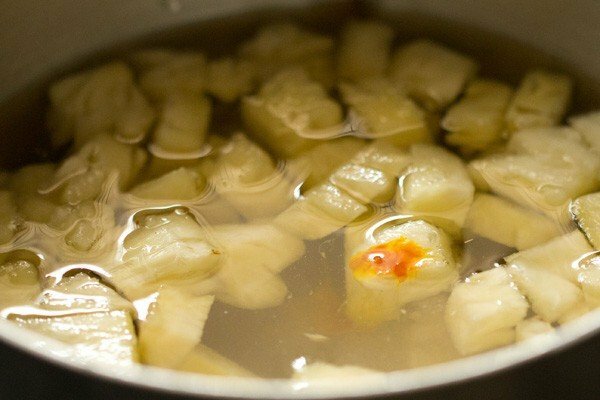 12. by this time, the pineapple + water mixture would also begin to boil. 13. pour the pineapple mixture to the pan with the roasted sooji. 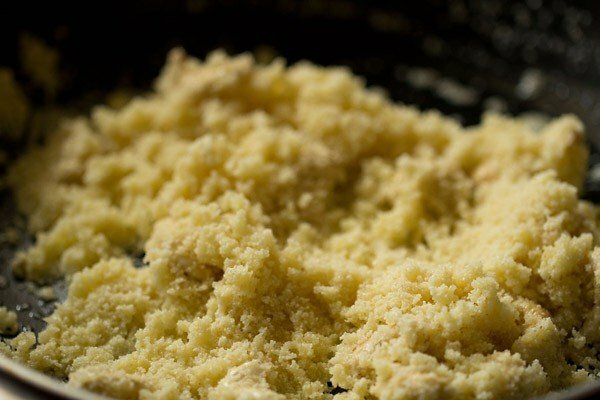 be careful as the mixture splutters. 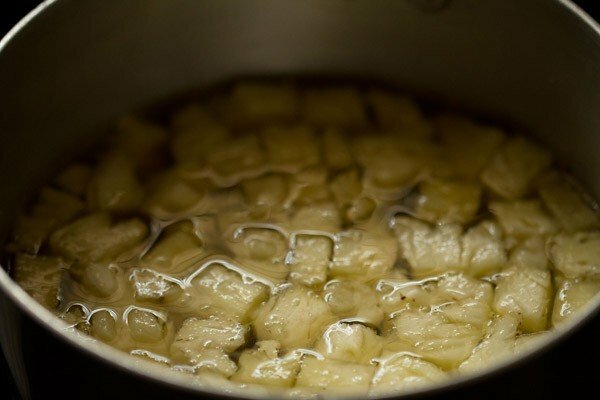 14. stir quickly and briskly so that lumps are not formed. 15. simmer on a low flame and allow the sooji to absorb the water. 18. in just about 4 minutes, the rava will soften up and the pineapple kesari is done. you should not see any creamish specks on the pineapple kesari. this means that the rava has not cooked properly. 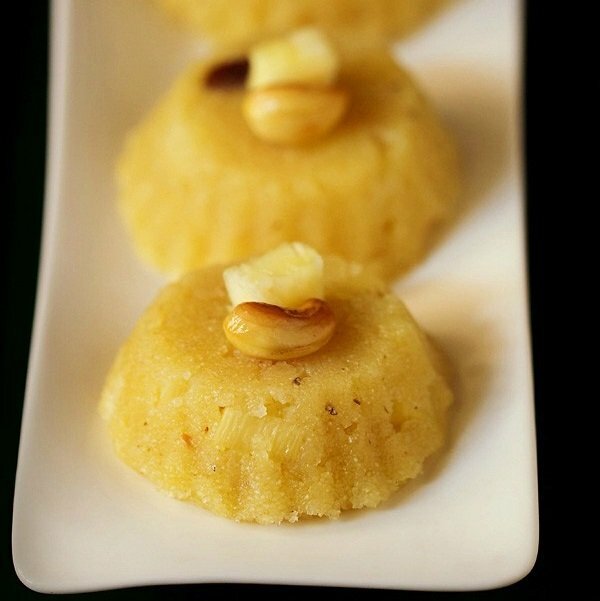 if you want to slice pineapple kesari like barfi or serve them like i have done, then pour the hot mixture in a tray or in small to medium tart moulds. press with a spatula to even. once warm slice them or unmold them. 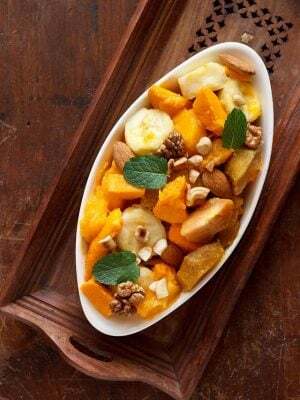 19. garnish with a few pineapple cubes and serve pineapple halwa hot or warm. 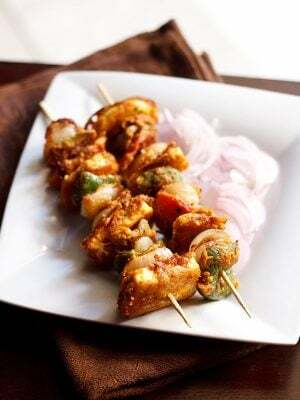 for more rava recipes, you can check this collection of 33 rava recipes.